Mankind has always sought refuge from the hot sun. The word pergola is originally a Latin word meaning projection from a roof. 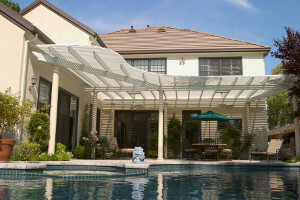 Pergolas were first seen in ancient Egypt as a means of providing shade from the intense sun. The earliest known garden plan dates back to 1400 BC, belonged to an official of the Egyptian High Court of Thebes, and includes a pergola over the entryway into the garden. Ancient Egyptians used their pergolas to aid in growing fruit trees, pomegranates and figs, as well as grapes. The structures were also utilized in ancient Roman where they were called peristyles. In both ancient Egypt and Rome, pergolas were found almost exclusively among the wealthy. Privileged Romans built pergolas in their villas so they could enjoy the shade on hot days without having to be outside with the lower classes. During the 1400s, France’s Charles VIII invaded Italy and brought the concept of pergolas back to France. The French noble class began to use them for relaxation in their garden spaces. Prior to the 17th century, pergolas were typically long green tunnels of vegetation that served as garden walkways. During the 17th century, pergolas began to resemble modern pergola structure, though they were typically larger in size. The 17th century Italian Renaissance with its focus on beauty saw a giant surge in the use of pergolas. During this time, large and dramatic smooth stone pillars were featured in the design. Pergolas went out of style during this time. More natural gardening styles were favored. Pergolas resurfaced in garden areas and are enjoyed by people of all cultures and classes as a means to add beauty to their landscaping as well as providing a relaxing outdoor space. To find out what a pergola can do for your home’s landscaping in the Boise, Meridian, Eagle, Southwestern Idaho, Ontario, Baker City, and Eastern Oregon, contact us today at Pacific Home and Patio!